Marion Kavanagh was born in Milwaukee, Wisconsin in 1876. Her mother was an artist who encouraged Marion to pursue an artistic career. Marion studied at the Art Institute of Chicago and then with William Merritt Chase in New York. Chase was a proponent of outdoor painting and instilled in his students the importance of working from life. Marion returned to the Art Institute in Chicago to teach for several years before heading out west to study for a short time with William Keith in San Francisco. When Marion decided to travel to Southern California in 1903, Keith advised Marion to look up Elmer Wachtel, a landscape painter whom Keith admired. When Marion arrived in Los Angeles she took Keith’s advice. Wachtel and Marion were married in Chicago in 1904. Once she was married, Marion began signing her paintings “Marion Kavanagh Wachtel”. She held solo shows of her work and also exhibited with her husband. Her watercolors were popular and she regularly exhibited in group shows on the east and west coasts. To avoid competing with her husband, Marion chose to paint only in watercolor until Elmer’s death. Marion’s watercolors have a unique pastel color sense and atmospheric quality, separating her from most of the other painters of that time. Her diverse oeuvre includes portraits, California Coastal scenes, the Sierras and Sonoran desert. 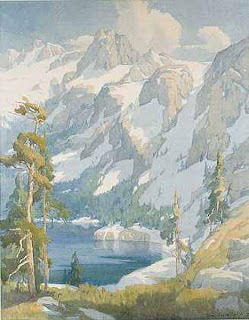 She was a founding member of the California Watercolor Society and was active in the Pasadena Society of Artists and the Academy of Western Painters as well as the New York Watercolor Club. After Elmer Wachtel’s death in 1929, Marion took a hiatus from painting for a few years. When she picked up a brush again in 1931, it was in oils. Her oils show the same mastery her watercolors demonstrate with atmosphere and color. Marion died in Pasadena in 1954. 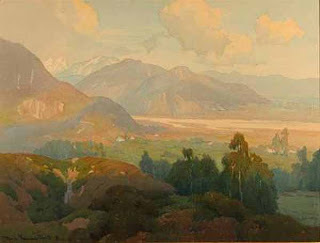 All Things Bright and Beautiful California Impressionist paintings from the Irvine Museum. I have a small painting by M. K. Wathtel titled "The Oaks". Wondering about the value.